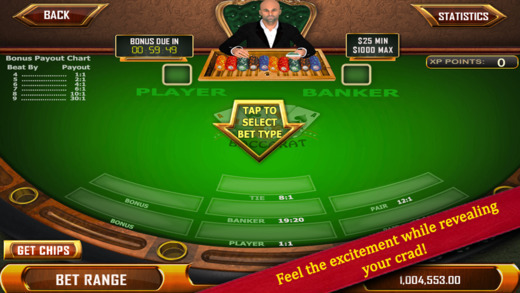 This Baccarat app has been designed by professionals from the casino industry keeping in mind all the aspects so as to give an authentic and real Baccarat experience to the users on mobile. The tables are real, the dealer is real, the cards are real!! You will feel that you are in a real casino and playing the real thing with just a difference that you don’t have to lose real money. 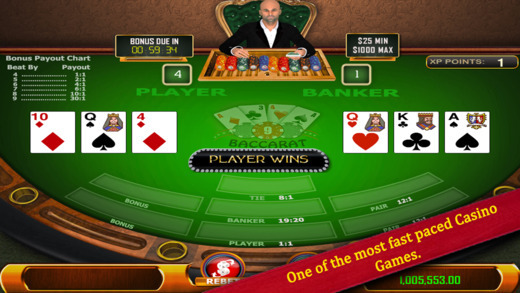 Baccarat is one of the games for the high rollers and we bring the best possible app to experience this. Bet on banker, player difference for bonus payout. Pair bets are also available. English and Chinese language option available. 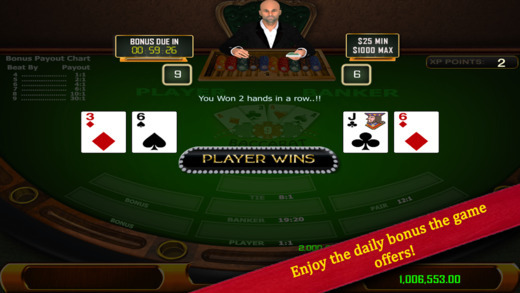 Casino ambience – Music and Sound to enhance the user experience! Pattern detection to help you plan your bets. Add pattern of your liking to suite your game strategy. Squeeze play option to show your card. 4 different bet range to chose from. Play with more than 1 deck of cards. Options such as swapping your bet amounts available. Share more to win more bonus point. Like our app on Facebook and get FREE bonus points. Redeem bonus points to earn FREE chips. Achievements will get you bonus points which will help you redeem FREE chips. 10 different achievements to unlock.